Ideas, activities, lessons, and comments from teachers that relate to Aminah and her work. Thanks for sharing! Please click on the "next" and "previous" buttons above to review the ideas. While teaching in Pittsburgh I used Aminah's book, "A Street Called Home," as a teaching tool for several quilts and banners. I worked with children ages 4-12. They made patterns and then cut them out of fabric. The final touch was the embellishing with buttons and beads like Aminah. They were very proud as the pieces progressed and they saw a community come to life in our eight-week time together. These pieces were shown in the final production at the end of the summer. When I considered planning an art lesson with my students about Aminah Robinson's art, I thought about creating a lesson that dealt with the importance of work and the jobs our ancestors did and relating it to Aminah's A Street Called Home. When the lesson started to unfold, it became a lesson on ancestors with a different emphasis. Instead of just the occupations of our elders, it was broader. It became a lesson on what our elders and ancestors do (did), why we cherish them, special memories of times spent with them, or the stories we were told about them, and how they influence us (our lives and our art). 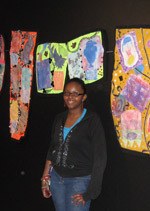 Have each student select a work by Aminah from the "See" section of this website. Have them look at the object carefully, and if available, listen to Aminah talk about it. Have the students write down as many words as possible to describe it. Discuss metaphor and simile and have them create some examples about the painting or sculpture. Then have them write a poem that includes rich description and at least one simile or metaphor. Have them submit their poems to the "Share" section of the website. Be sure to have them note which work of art inspired their poem. Some will be selected for online publication. GCSE COURSEWORK - BEING A YOUNG PERSON IN LIVERPOOL IN 2008, THROUGH THE MEDIUM OF TEXTILES. Students aged 14/15 studied the work of Black American textile artist Aminah Robinson whose roots were in slavery and whose textiles were traditionally founded in the feminine craft of quilt-making. Students could see how she emulated the way women used to gather together to make a wedding quilt, or a quilt for a baby by producing large-scale pieces that struck at the heart of her community and her own life. Students were shown images of Robinson's work and produced pages of research from school resources and the Internet. They used a wide range of media and techniques to extend their skill base. I did two assignments this year based on Aminah's work and Website. I took the Story Lesson from the Teach section of the Website and had the 7th grade students transfer the images onto shopping bags so the students could carry the stories with them wherever they go. The second lesson was research-driven and based on the Unwritten Love Letter lesson plan in the Teach section of the Aminah's World Website. Each eighth-grade student had to find a person or event that exemplified the strength and roots of the civil rights movement. Students at the Cooperative Artists Institute in Boston, MA recently finished a "banner" in our after-school teen program that is, in part, an homage to Aminah's work. The teens created prints on paper and cloth during the year, then we assembled the cloth prints into a set of "Dancing Drums" complete with stitches, buttons, and beads. Our project is currently on view as part of Community Creations at the Isabella Stewart Gardner Museum in Boston. 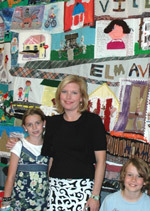 The fourth grade students at Terrace Park Elementary School have teamed up with the Terrace Park Historical Society to create a mixed-media mural that was unveiled at the school's annual Art Show and Open House on May 20. The mural, or quilt, is made up of individual panels created by the students—each one representing architecture, personalities, organizations, geography, history, or events that characterize the village of Terrace Park. To accompany their artwork, students worked in the language arts classroom to develop written pieces about their elements of Terrace Park's history.